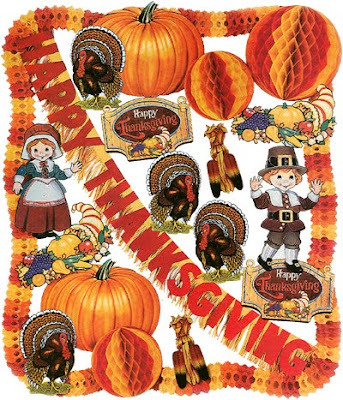 In the United States, Thanksgiving began with the Pilgrims who settled around Plymouth in December of 1620. During the winter of 1620-21 they suffered many privations. Food and supplies were scarce and disease ran rampant in the region. Nearly half the population died. At the harvest of 1621 there was a feast. However, 1622 the results were fairly poor. The settlers were beginning to starve again. The Governor at the time, William Bradford, was quick to recognize the problem. So every family was assigned a parcel of land according to the proportion of their number...It made all hands very industrious, so that much more corn was planted than otherwise would have been...and gave far better satisfaction. Thankful for the re-institution of private property and the plenty which it provided, the Pilgrims invited their Indian benefactors in 1623 to a three-day celebration. More than 80 "Indians" came to enjoy the festivities. They brought venison, wild turkey and other victuals. There was much singing, rejoicing and even sermons. The first Thanksgiving in Plymouth was not meant to be an annual event. Even so, it became a custom in many New England Colonies. During the Revolutionary war Thanksgiving Days were proclaimed to celebrate victory in battle or survival in the face of adversity. After the war and the founding of the government under the U.S. Constitution, George Washington, as President, proclaimed a day of thanks. Proclaiming a day of thanks became popular. There was no official national day, but individual states, cities and towns began to pick out a particular day every year, usually in the autumn. The state of New York was the first to do this in 1830. By the time of the Civil War thanksgiving had become a popular public event. In 1863 and 1864 President Lincoln proclaimed the last Thursday in November as a "day of thanksgiving and praise to our beneficent Father." It was at this point that the last Thursday in November became fixed in the minds of Americans as a day for giving thanks, at least until 1939 when President Roosevelt moved it up a week to make a longer Christmas season for the retail industry. Some people did not like the break with tradition and various localities refused to comply. Finally, Congress intervened and changed the holiday permanently to the "4th Thursday in November". It has been celebrated on this day ever since. Portuguese Trick or Treat - did you know? Pet Log - Is it Jessica Rabbit?